Iraq, "the cradle of civilization," had its modern borders drawn after the end of World War I, when the Ottoman Empire ceded control of the country to Britain. It has the world's second largest petroleum reserves. 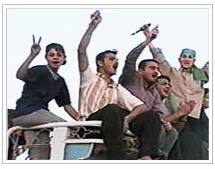 In February 2003, FRONTLINE/World correspondent Sam Kiley went to Iraq to cover a war that everyone knew was coming. He was reporting from the northern front, an area controlled by the Kurds since the first Gulf War. In the weeks Kiley spent in Kurdistan, he would discover a land and a people haunted by Saddam Hussein. Read Kiley's harrowing account of kidnapping and near execution while reporting from Iraq. Get his take on the story, and find out what he is willing to risk--and not risk--in order to tell it. Read a discussion with FRONTLINE/World reporter Sam Kiley about his most recent journey accompanying U.S. forces and Kurdish soldiers battling their way south into the oil-rich city of Kirkuk, and dealing with the post-war conflicts between Kurds and Arabs.